I wanted to show you my favorite holo of the bunch - HITS Poseidon! A Nice blue polish with a strong holographic effect, even outside of sunlight. It's a little bit sheer, I am showing 3 coats though, so it's solid enough not to be a deal killer. I'm loving the blue colour in a holographic polish, I have wanted Nfu-oh 65, but it was out of stock last time I ordered. However, Poseidon satisfies my blue holo hunger! Mmmm I want to order all the HITS now, this is probably one of my favorite polish brands right now. Do you have any HITS polishes? If so, what are your favorites? This is beautiful! I don't have han HITS yet. I'm actually collecting a bunch of awards to do all in one post... there's so any I need to catch up on! This is stunning! 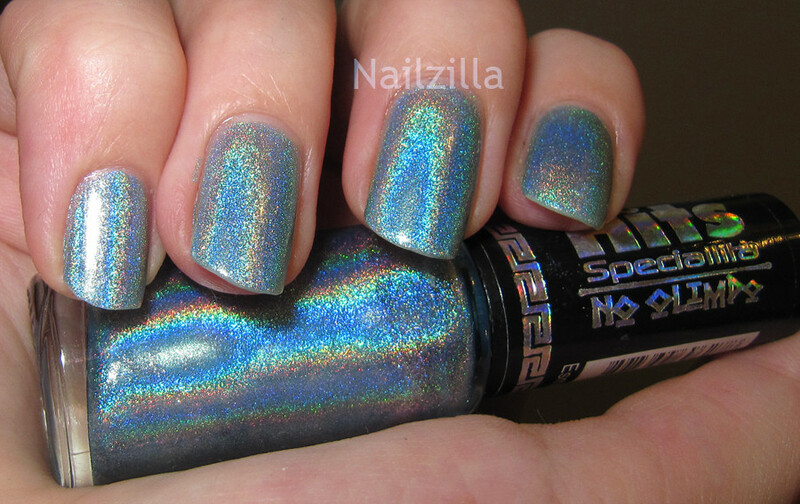 I don't own any Hits polishes, but if I did this would be #1 on my list.